Located on the western side of Waverton Peninsula, the Coal Loader presents a curious relic of heritage infrastructure with an overlay of contemporary urban landscape treatment. Set in the context of Sydney Harbour and the bushland environment of Balls Head, the site was originally a place of physical and spiritual sustenance for Aboriginal Australians. The Cammeraygal people lived on the peninsula for thousands of years as evidenced by a large rock carving that still survives at the site. It is difficult to know the level of impact that construction of the Coal Loader had on the Aboriginal community and cultural values but it is reasonable to think it was severe. While the Coal Loader itself is an impressive engineering feat, particularly given the technology available in 1916, it was not welcomed by all members of the community at the time. Controversy followed the development from the early 1900’s as highlighted in the 1916 protest poem by Henry Lawson called “The Sacrifice of Balls Head”. Written in opposition to plans to construct the coal depot on Waverton Peninsula Lawson laments the loss of picnic parties, boating couples, wildflowers and great brown rocks that were to be replaced with soulless cranes and grimy loads of coal. It is striking how much the words and sentiments in Lawson’s poem echo those heard in opposition to some of the development currently taking place in Sydney. Despite the opposition, construction of the coal loader went ahead. Completed by the early 1920s the loader continued to operate in its original configuration until the mid 1970’s. The Waverton Coal Loader functioned primarily as a transfer depot for coal from bulk carriers to smaller coal-fired vessels. A major component of the coal-loading operation was the extensive elevated platform structure on which large stockpiles of coal were stored until being loaded on to ships. Four tunnels run beneath the 180 metre long platform for its full length. A series of square holes installed in the platform incorporated chutes through which coal was dropped into 'skips' positioned in the tunnels below. A cable-hauled railway system ran as a continuous loop through the two western-most tunnels to transport the coal ‘skips’ out to the finger wharf in Balls Head Bay, where it was loaded on to moored steamers. This loading system was replaced in the mid 1970s by a high speed conveyor to allow loading of large colliers that carried coal to Japan until 1992. With the recent opening of the Coal Loader platform as a public recreation space the site has come full circle to return to public use even though in a very different form. 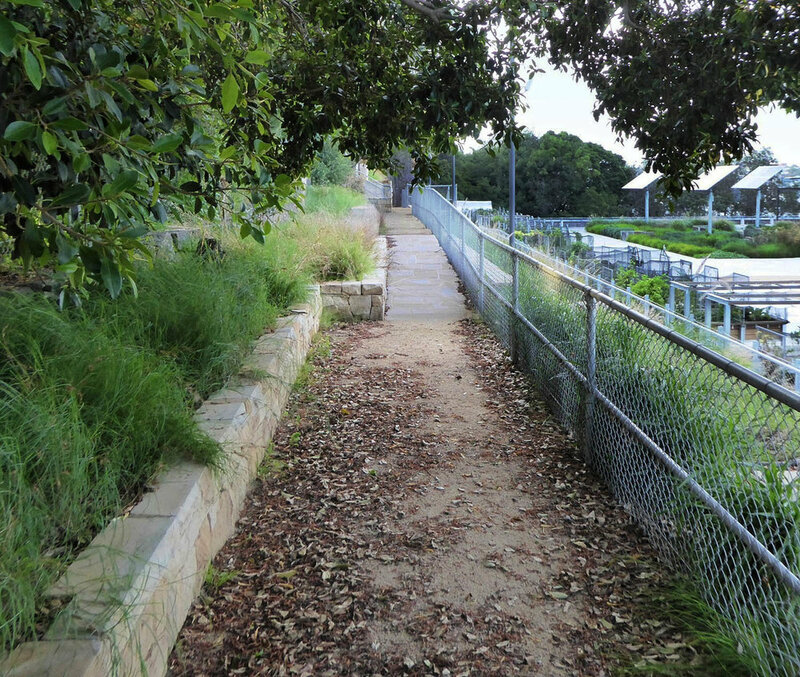 Dedicated as public open space in 1997, the site was formally transferred to North Sydney Council in 2003. Encouraged by community lobbying, Council worked with State and Federal Governments to transform the site in to an engaging and popular public facility. The Coal Loader Centre for Sustainability was opened in July 2011, making use of the caretaker’s residence and other heritage buildings to promote innovations and technologies for sustainable living. 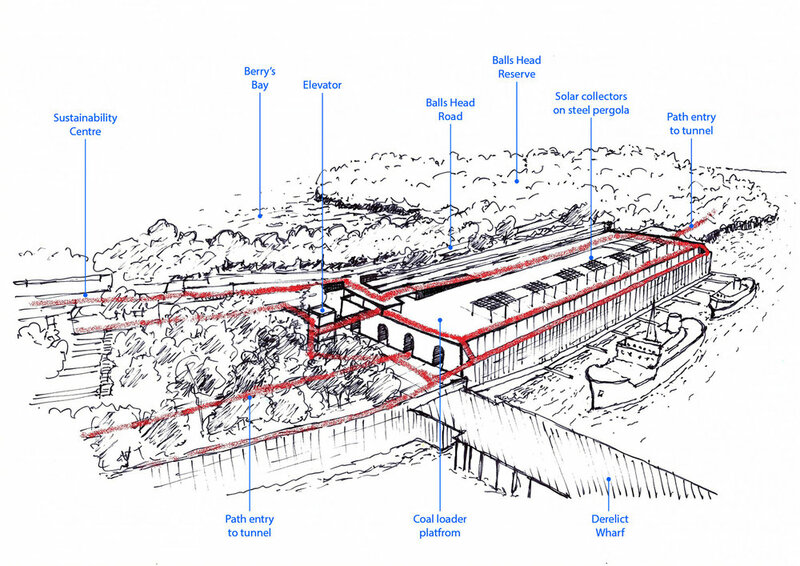 The master plan and documentation for redevelopment of the Waverton Coal Loader as a major new public recreation space was prepared by Clouston Associates on behalf of North Sydney Council. Funding for the project was provided by North Sydney Council ($3 million), the Australian Government ($1.87 million), and NSW Government ($860,000). Completion of the Coal Loader platform project, which was officially opened in March 2018, is a testament to the commitment of North Sydney Council and particularly Council’s landscape architect David Banbury who championed the project. Community engagement with the Coal Loader site is demonstrated by the community garden structures aligned along the eastern edge of the platform with their regular form creating a visual rhythm. The domestic character of vegetables and flowers growing in the structures contrast with the large scale and robust visual character the landscape planting that features limited species and post-industrial elements that include high sandstone walls and numbered steel covers that indicate the locations of the former coal chutes. The Waverton Coal Loader site provides a rare combination of spatial experiences that range from complete enclosure within the tunnels to open space expanding out across Sydney Harbour from the main platform. The diversity of spatial experiences is reinforced by the varying views that quickly change as you move toward, around and through the Coal Loader structure. Approaching the Coal Loader entrance from the east along Balls Head Road the platform is hidden from view by a solid masonry wall until you arrive at an opening and the platform is revealed in an elevated view that extends out across the western portion of Sydney Harbour. You then enter the site on a newly constructed concrete platform the takes you to the top of a wide concrete ramp down which you descend to the main platform. A strong visual contrast occurs between the solid geometric platform laid out in the foreground and the fluid water and curving foreshore of Sydney Harbour visible to the west. In stark contrast views to the east from the platform are generally blocked by a combination of retaining walls and terraces with trees adjoining Balls Head Road on the ridge above. The Coal Loader can also be approached from the north by walking though a grove of trees to arrive at a massive sandstone wall punctuated by the arched entrances to the four tunnels that run below the platform. Entering the dark tunnel creates a dramatic physical and visual experience with light at the southern end of the tunnel forming a tiny distant glow. Moving through the tunnel you become very aware of the uneven pavement and presence of water puddles on the floor as well as the rough surface of the tunnel walls and ceiling. Arriving at a point below a former coal chute a column of daylight forms a surprising contrast to the darkness. Moving further south along the tunnel the southern entrance becomes increasingly visible with the outline of trees eventually apparent. When you finally exit the tunnel you find yourself in a space defined by a large Fig tree with the track running off along the steep western side of Balls Head. The track also provides an alternative route to approach the Coal Loader from the south with the experience of moving through the tunnel reversed. Arriving at the northern end you walk in to a space in which a prominent feature is the high tech glass-sided elevator that provides access between the lower level at the entrances to the tunnels, the Coal Loader platform level and the upper entrance from the Sustainability Centre. The rectangular form of the 180 metres long elevated Coal Loader platform provides wide sky views that generate a keen awareness of the sky and the location of the sun at various times of the day. The platform provides a unique location to enjoy spectacular sunsets that not only fill the sky but reflect on the water surface of the Harbour to expand the visual spectacle. In total contrast to this open character is a unique exhibition space created by Council in the cavity behind the harbour side front wall supporting the coal loader platform. The space is accessed from the western most tunnel and comprises a sequence of spaces defined by concrete walls with openings that allow visitors to move between them. The rough stone and concretes surfaces reflect a strong post-industrial character that contrasts with the artwork exhibited in the space from time to time. A strong sense of geometry is created by the layout of the platform with regularly spaced former coal chutes, blocks of native grasses planting, turf, a steel pergola structure with gridded solar panels, light posts, balustrade and vertical interpretive glass panels. This geometry contrasts with the natural form of the remnant woodland vegetation of Balls Head to the east and the vegetated curving shoreline of Sydney Harbour to the west. Standing at the balustrade along the western edge of the platform creates a sense of standing on the deck of a large ship with broad open views out across the western portion of Sydney Harbour with the movement of boats providing a dynamic cinematic experience. A notable aspect of the coal loader platform are views of large jet aircraft regularly moving across the western sky as they approach and depart Sydney Airport. The moving aircraft are often framed by the vertical and horizontal elements of the steel pergola along the western side of the platform, visually linking the Coal Loader to the flight of aircraft. Two ships moored alongside the Coal Loader that are being restored and the derelict timber deck of the former coal loading wharf both provide a reminder of the former industrial maritime operations that took place here. They also create a visual contrast with the ordered landscape character of the Coal Loader platform with its contemporary landscape overlay on the heritage character of the supporting walls and tunnels below. A distinctive aspect of the Coal Loader is the constantly changing views and spatial experiences as you approach, move across and through the structure. This dynamic combination of urban spaces is located at the interface of well established urban development, the natural landscape of Balls Head Reserve and the western portion of Sydney Harbour. Although extensive historic imagery and text are presented as part of the interpretive exhibition at the northern end of the platform, perhaps a more explicit reference could have been made to the original coal handling superstructure that stood above the platform and the piles of coal. Nevertheless the adaptive reuse of the Waverton Coal Loader as a public open space has resulted in a major new contribution to the assembly of harbour front post-industrial public places that can be enjoyed by Sydney residents and visitors alike. The connection between the site and Henry Lawson’s protest poem provides an additional layer of meaning to this unique site. The State is cutting down Ball's Head. To make a wharf for coal. And not a cent to pay. And drag their sordid loads. To make their old hearts glad. A sordid crime has been achieved!